A very warm welcome to the Chinese Embassy. It's a great pleasure for me to host you here. I hope you will permit me to use the acronym JITSIC, rather than the challenging full name of Joint International Tax Shelter Information Centre. I am not sure if any Chinese Ambassador in Britain has welcomed guests to his Embassy on the issue of "tax avoidance". Certainly it's a first as far as I know! But on the point of avoidance, I am reminded of that very famous quote from one of the founding fathers of the USA, Benjamin Franklin. In 1789 he wrote: "in this world nothing can be said to be certain, except death and taxes." That most famous of British economists, John Maynard Keynes, who lived between 1883 and 1946, wrote: "The avoidance of taxes is the only intellectual pursuit that carries any reward." For millennia governments worldwide have been seeking to prevent tax avoidance. But the work of JITSIC would surely have surprised John Maynard Keynes with its global collaboration on tax avoidance. Turning to the involvement of China in JITSIC. First of all, on behalf of the Chinese State Administration of Taxation and the Chinese Embassy, I would like to thank JITSIC members. This is for the valuable trust and support JITSIC founding members have given China that enabled its membership. My appreciation also goes to the Her Majesty's Revenue & Customs for its kind assistance and support given to the Chinese delegates. The Chinese Government is truly grateful for the generous goodwill, cooperation and friendship you have all shown to your Chinese colleagues. It has been only 4 months since China became a member of JITSIC, but we in China believe that "well begun is half done". As a result of your meetings here in the UK, I am confident that China's cooperation with JITSIC will be more effective and productive. I would like to take this opportunity to offer my personal congratulations to Mr. Dave Harnett, the Permanent Secretary for Tax at Her Majesty's Revenue and Customs. It was back in 2004 that Mr. Harnett started playing a leading role in the creation of JITSIC. History may judge that JITSIC is on a path to having a very significant impact on global tax systems. Today we are gathered here to celebrate China's JITSIC membership, and I would like to take this opportunity to help build even better co-operation between our countries. I will do this by telling you three points about China. The first point concerns the stage of evolution of New China: China is a developing country. China is the second largest trader in the world with the largest exports of goods in recent years. 54 Chinese businesses now feature in the Fortune 500 list. ICBC, China's largest bank, now ranks as the world's biggest company by market value. The international community is using more and more new terms that involve China, such as 'BRICS', 'emerging economies' and 'the eastward shift of global economic power'. The World Bank has said that China has industrialised at an equivalent rate in 20 years that took the USA 100 years. The consequence of that rapid industrialisation is that China suffers from serious environmental issues. Britain and the USA took decades to clean up the environmental impact of their industrialisation. Now China must achieve comparable clean goals in a fraction of that time. The costs and effort will be immense. China is also struggling to deal with imbalances between investment and consumption and a lack of scientific innovation. Development in China remains a very serious uphill journey. At the same time as it develops China must address the imbalances and lack of coordination and sustainability in its current development model. However difficult the task of its reform, China needs to seize the opportunities and focus on development. China's development is faced with risks, some predictable, some not. Urbanisation by moving over 200 million people from rural areas over the next decade. Investing in infrastructure to keep pace with the needs of industrialisation and urbanisation. Internationalization with a commitment to open trading and the market economy. Boosting domestic consumption in China. Boosting innovation in science and technology. And last but not least - expanding education opportunities for all of the people of China. China adopted last month its 'blueprint' for economic and social development in the next 5 years – the 12th Five-Year Plan. Improving people's livelihood such as with better basic pay and health benefits. Driving towards a goal of a low carbon economy by raising energy efficiency and protecting the environment. Deepening the policy of reform and opening-up and pursuing scientific development. The second of the three points I want to explain to you today is 'creating a harmonious society'. If you are familiar with the past few millennia of Chinese history then the concept of 'harmony' in Chinese culture is easy to grasp. Social justice and equality of people. Dynamism and determination in the face of adversity. Stability and peaceful social order. Harmony between mankind and nature to create a sustainable world. Integrity and international friendship and goodwill. New China is just over 60 years old; China needs time to reach the stage of development of developed countries such as Britain and the USA. Every country develops in different ways and at differing speeds. These are some of the ways China is developing. China is constantly strengthening democracy and its legal systems. China has seen the growing role of the National People's Congress and multi-party political consultation under the leadership of the Communist Party. Democratic decision making and the legal system have been strengthened. The millennia-old pattern of "rule by man" is giving way to the rule of law. Also China has seen significant progress in human rights. The promotion and protection of human rights has been written into the Chinese Constitution to ensure people's rights to equal participation and development. Chinese society is increasingly dynamic, open and transparent. This characteristic was most notable for the whole world with the examples of the Beijing Olympic Games and the Shanghai World Expo. In this digital age China is developing fast. There are now 450 million internet users and 120 million micro-bloggers. Over two thirds of Chinese internet users, that is 300 million of them, regularly air their views about state affairs online. Microblogs are increasingly popular platforms for members of the public to be part of governance. More than 57 million Chinese traveled outside China in 2010. Over 280,000 Chinese are currently studying abroad. More than 55 million people from all over the world visited China during 2010, 260,000 came for study. As I indicated, our new Five Year Plan places heavy stress on a strategy of moving from a high to low carbon dependency. This means China is giving a high priority to environmental protection. The Chinese people have come to realise the importance of green and low-carbon development. As a result we are encouraging a resource-efficient and environmental-friendly way of production and consumption. Sustainable development is a top priority of the Chinese government. This all adds up to a major change in the development strategy of China. The Chinese people have gone through a major shift from growth-oriented development to a new model. This new approach pays a lot more attention to environmental impact and reasonable energy and resource consumption. The final of the three points I want to make is about China's impact upon the world. China is a positive force in the world. In all of global history, China has never been so closely linked with the world as it is today. And resolving the issues of climate change. China is ready to advance with the world through its peaceful development. China follows a 'defensive' defence policy. It has solemnly proclaimed to the world that China would never seek hegemony or expansion. China stands for non-interference in others' internal affairs and supports negotiated solutions to international disputes. China is committed to world peace and stability. My country understands that a peaceful international environment is in its interest, and its development in turn will help promote world peace. China is ready to engage the world in exchanges and mutual learning through its open development. The 12th Five-Year Plan calls for a more open China. That means drawing upon the best achievements of human civilization. It means working with the international community in an even more practical manner. Adjusting its trade mix; this means winning a better balance with our "bringing-in" and "going-global" efforts. China will promote investment and trade liberalisation and facilitation. My country will be an active part of global governance and regional cooperation. The result will be that, as China continues to develop, the world will both enjoy economic growth and prosperity. We live in an era of economic globalisation when countries are increasingly interdependent in trade and investment. This globalisation means it is imperative that all countries cooperate in the financial sector and taxation. JITSIC is an important platform for taxation cooperation among countries. It aims to identify, address and deter abusive tax schemes through timely information exchange and knowledge sharing and fast tax examinations. It is an effective supplement to ongoing work of national tax administrations. As a new member, China will abide by JITSIC policies and fulfill its obligations and engage other members both bilaterally and multilaterally in tax matters. This will help curb and prevent tax avoidance attempts and contribute to a sound global order of taxation. I am sure that JITSIC will do well in containing tax avoidance internationally; with the joint efforts of all member states this co-operation can contribute to global growth and prosperity. I wish you every success for the JITSIC partnership. 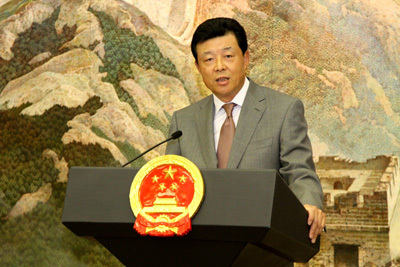 On 27th April, Ambassador Liu Xiaoming hosted the Chinese Embassy-JITSIC event in the Chinese Embassy in the UK to celebrate China's joining JITSIC as its seventh full member. Present were Mr Dave Hartnett, one of the initiators of JITSIC and Permanent Secretary for Tax of HM Revenue & Customs, and JITSIC delegates from member states working in its London Office. Founded in 2004, JITSIC aims to strengthen inter-governmental cooperation and enhance ability to curb business and individual tax avoidance attempts. 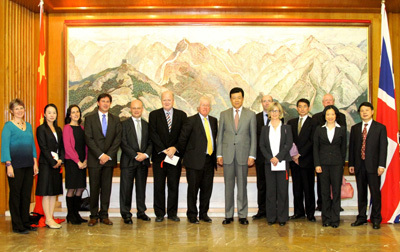 China became a full member in December 2010. Other members include Britain, the United States, Canada, Australia, Japan and the Republic of Korea. 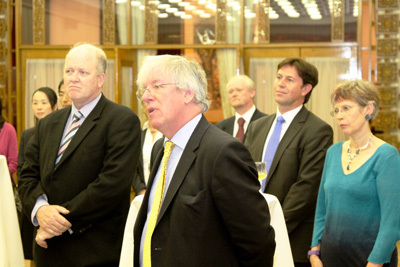 JITSIC has two observers – France and Germany and has opened two offices – one in London, the other in Washington.